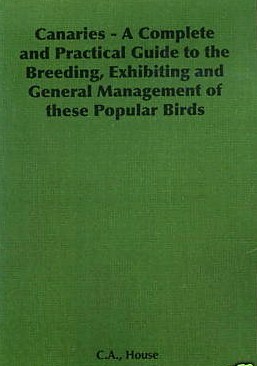 "Cage Bird Hybrids" " House's Canary Manual" " The Fantail Pigeon & How to Breed & Exhibit Them" " The Norwich Canary" " Magpies & All About Them " " Rabbits and All about Them" and many books on Bantams & Chickens. The amazing thing about the Judge C.A.House, on the same page below High Wycombe's show the report was one for Truro (Cornwall) dated 26th December 1907 (Boxing Day) which had been a day before ours and the judge was none other than Mr C. A. House. He must have travelled the railways to get from Truro to our show in such short pace of time. Mr C. A. House was living in Walthamstow London at the time, he was born in the Southampton area and passed away in Shoreditch 1934. At the turn of the 1900's C. A. House was the best you could get to judge any show in the country, so our officials and contacts must have been very good. At the time of our show the magazine reports and talks about the fact that you were granted a licence from the Cage Bird Union and unless you had this you were in trouble. Research further into our past has been carried out by both Robin & Mick at the Local Study research centre in High Wycombe, where one can look through old micro film of local papers back to the 1800's, sadly it has revealed very little up to date but it is still on going. Here is a cover of one C.A.House books he published in 1926. An interesting advert from our 1908 show page in the magazine. The Oakley Drill Hall in the report was used by our society for years and years until around the 1960's it was demolished in the 1970;s. We know the society use to join the Fur & Feather group for a collective showing event but after 1933 it went on its own the members who broke away from them at time were Mr Tom Fraser of Totteridge, The Frasers had a shop in High Wycombe where you could purchase Iron Mongery and Gardening Products and possibly bird seed. Tom's claim to bird fame was that he achieved best Norwich Canary at the National Bird Show at Olympia. Another founder member was Mr Tom Pearce he was also from Totteridge, maybe a relation of our 1907 secretary Sidney Pearce, a third member from Totteridge was Mr Cecil Puddephatt who joined very shortly after the break with fur & feather, he was an active member within the club right up to the mid 1990s, Cecil sadly passed away in 1995. He was an outstanding club member, one of a number of our group who has brought the club to where it is today. The Puddephatts Cecil and his wife Margaret also a member, owned the grocery store opposite Totteridge Common before retiring. Another was Mr Burt Lewis from Loudwater, Mr Charlie Stevens came from the Desborough area. Mr E.A. Lacey he was a club member for years. Also a long standing member from soon after this period up to the turn of the millennium was George Lacey he benched best Yorkie at our annual show in 1999.